Apologies that I have been a bit absent on my blog recently. I have been super busy for the past few weeks, and I’ve got lots of great adventures to share with you all (as soon as I get time to sit down and type what’s in my head!). I’ve also been struck down by the dreaded hayfever that seems to have taken over Britain since the weather got warmer. Personally, I’m blaming London. Hayfever is always worse in the city, and since I visited the capital I’ve had an itchy nose, a tickly throat and my voice in the mornings makes me sound like a teenage boy. For three days last week it took all my energy to drag myself to work. As soon as I retuned home, all I wanted to do was sleep. As everyone knows, I hate being ill, and I’m really happy to be feeling better and ready to get going again. A couple of weeks ago I shared with you some of my photos from my recent trip to Bournemouth to celebrate my friend’s hen weekend. As well as getting to visit a new place, I was also lucky to try not one but two (yes, TWO :)) new activities in one day. The whole weekend was organised brilliantly by Kirsty. I didn’t envy her job. Cath’s friends range from those of us who are at our happiest in the great outdoors sleeping in a tent, to some girls who are more used to comfortable hotels and beauty treatments. 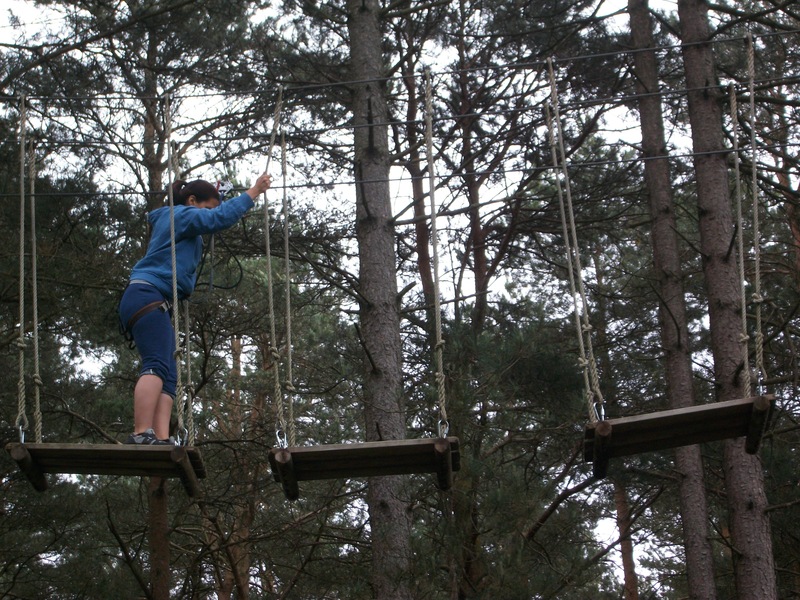 To please us all, Kirsty arranged for us to spend the day at Go Ape. 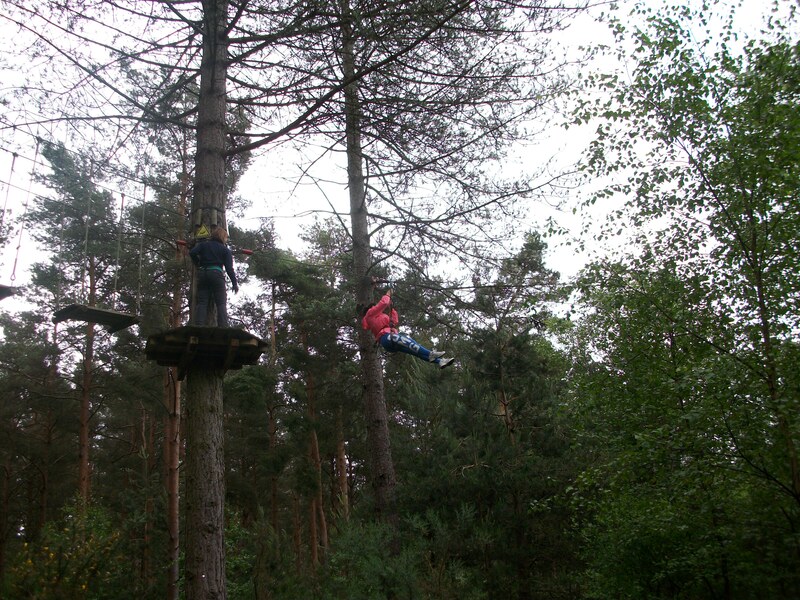 The first activity was the tree-top adventure. I was more than a little nervous, as I have a fear of heights. I took up indoor climbing a few years ago to overcome my phobia, and although I’m more comfortable at the top of the wall now and I’ve learnt to trust the equipment more, it’s still a fight everytime between my mind and my body. I was determined to not let the tree top adventure get the better of me, though, and I knew that I’d be disappointed if I walked away without completing the challenge. The experience starts with a training session, and you get ALOT of training because you’re going to need it. I always assumed there would be instructors up in the trees with us, but once they’re sure you are safe, you’re on your own. 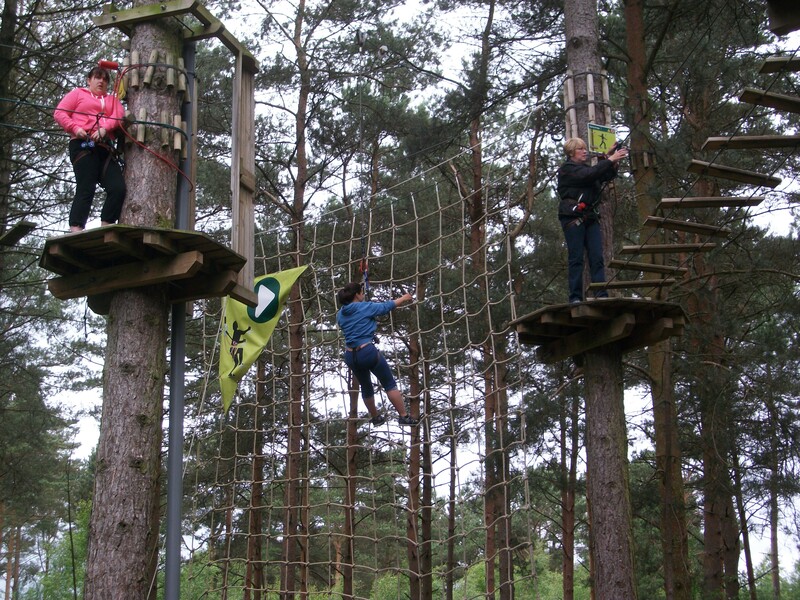 The course is split into five areas which are spread out amongst the beautiful woodland, and on each one the obstacles get harder and higher. Out of our group of 11, 7 of us attempted the first two areas. When you’re up there, it’s scary to know that your safety depends totally upon yourself. If your equipment isn’t clipped in properly before you set off over a balancing beam or down a zip wire, it’s entirely your own fault. When I started to get over the heights issue, it occured to me that this was a really physical challenge as well. 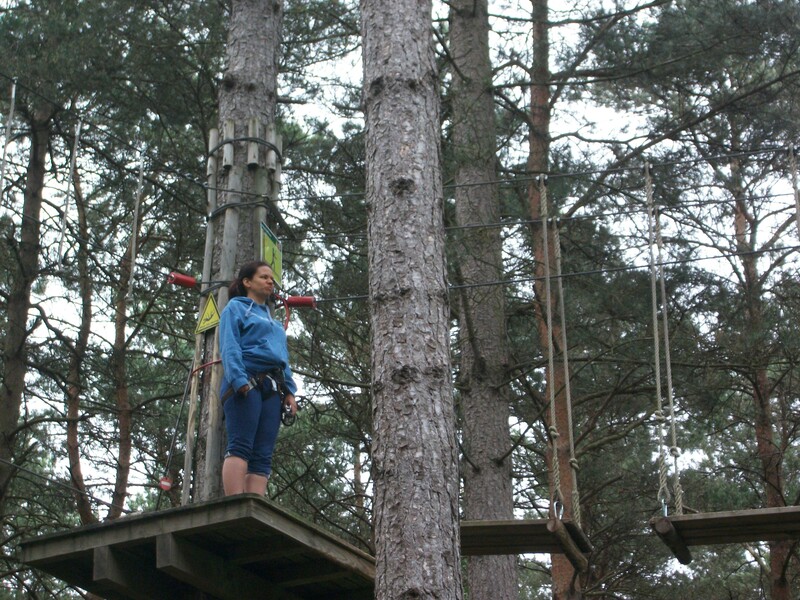 The obstacles (between the trees) weren’t easy, and climbing up rope ladders and cargo nets is hard work. Five of us continued on to the final three areas. As we progressed through the obstacles and got used to the equipment, my confidence grew. It really helped to have four great women on the journey with me. The biggest challenge for me personally turned out to be just before the end of the course. In the final area, there is a MASSIVE tarzan swing where you have to attach yourself to a rope, jump off a platform and swing into a huge cargo net. There is another option to avoid the swing, but I knew it would make me feel proud to accomplish the jump. We’d done a much smaller tarzan swing earlier on in the day which had been really smooth because when you jumped you were already at the full length of the rope. I innocently assumed the bigger jump would just be a bigger version. How wrong I was. There was a lot more rope still to give on this one, and as I stepped off the platform I dropped a good few feet before the swing kicked in. My friends very rarely hear me scream, but on that day some of them got to. 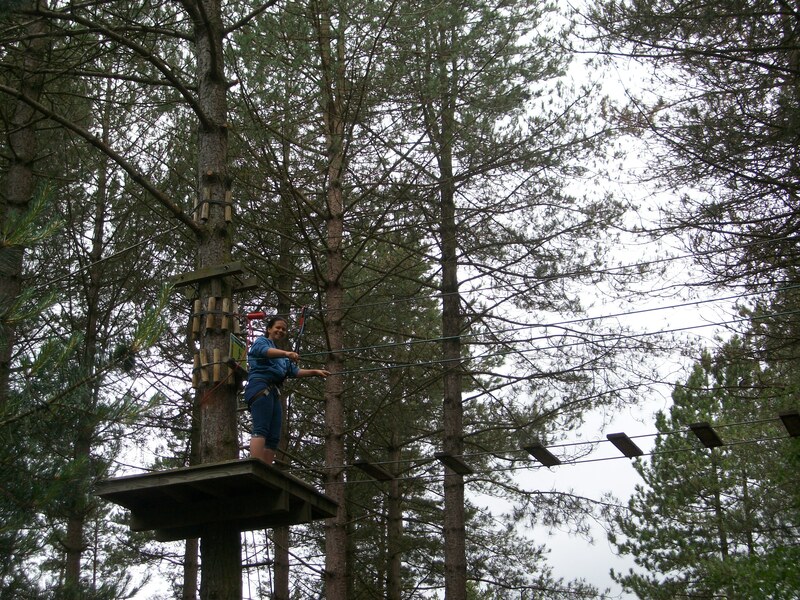 Each area ended with a zip wire, something I never thought I would have the nerve to do. 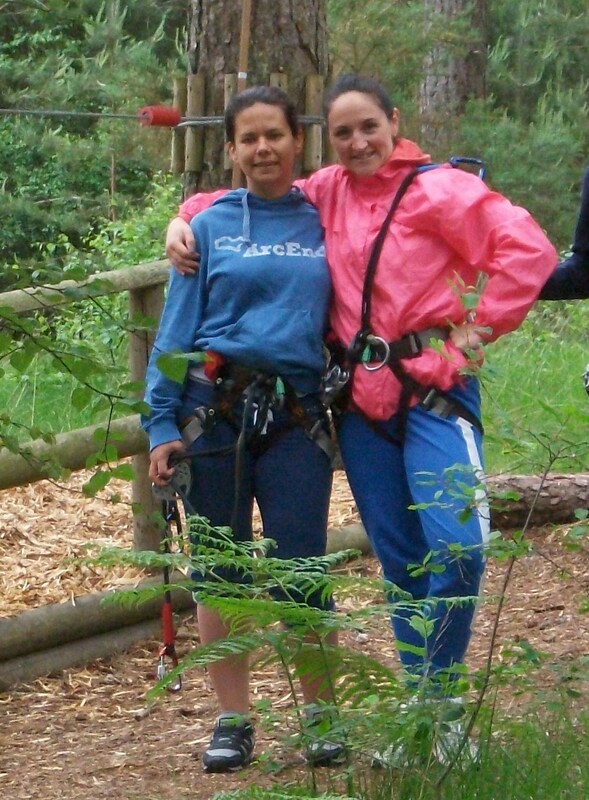 During training, our lovely instructor Kerry had told us that when you land forward on a zip wire you should start running in the air and then continue as you reach the ground. However, she added, you are much more likely to come in backwards or sideways. In which case you should relax your body and drag your feet through the wood chip they put down for a more comfortable landing. Everyone in our group landed at least one each forwards, except me. On every landing, not only did I come in backwards but I bounced along the ground three or four times before I eventually stopped. I even lost my shoe at one point. I had wood chip everywhere. It was in my underwear, my jogging bottoms, my shoes and my socks. When we returned to the hotel, I left a trail of the stuff from our room to the swimming pool. 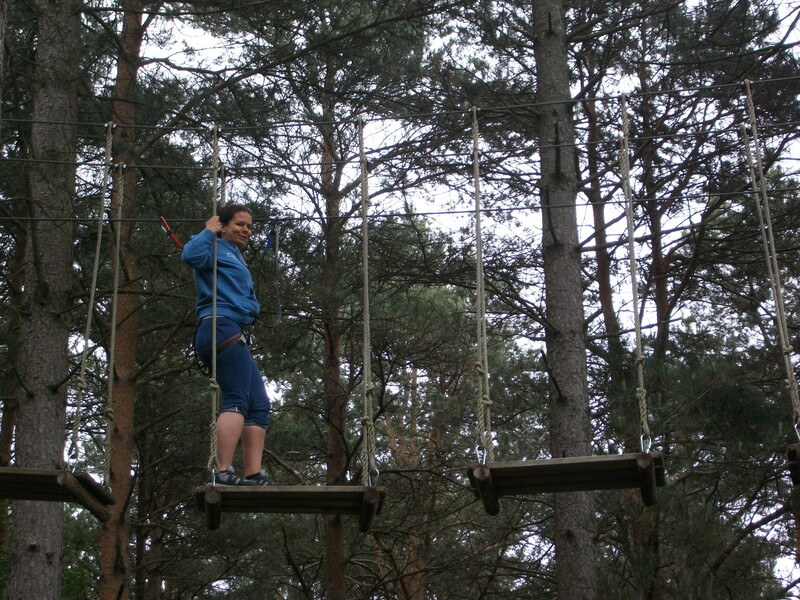 I’m so proud of myself for not only attempting, but completing, the tree-top adventure course. I never in my wildest dreams thought I could conquer my fears like that.